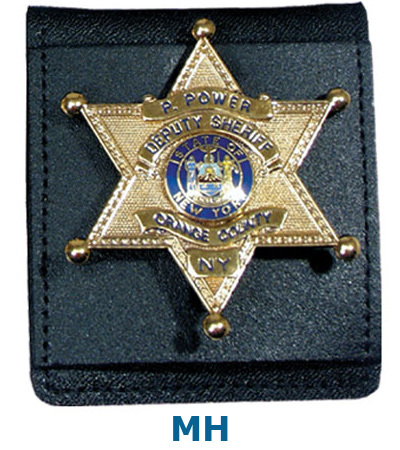 Badges in the leather are shown as example only. We cannot show every one of our badges in each leather item. Custom-cut/recessed models for neck wear! This neck chain holder is made from genuine leather. It comes with 30" beaded chain and velcro closure at the bottom. 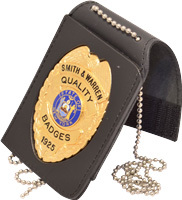 It is custom cut to fit any Smith & Warren badge. CUSTOM-CUT to fit your badge! 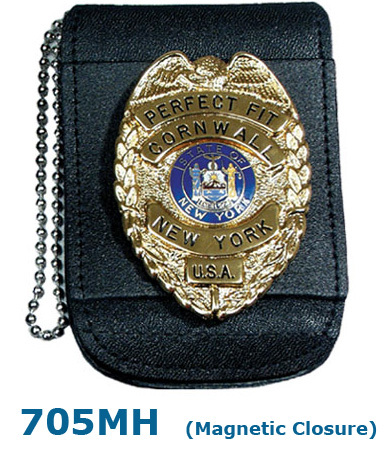 This holder is made from genuine leather and can be cut exactly to fit any badge style. It is designed with magnetic closure and intended to be worn primarily around the neck. This holder does not include heavy duty steel belt clip. It comes with ID/Credential section on the back and 30" beaded chain. 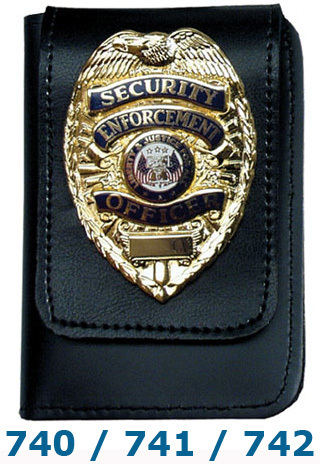 Recessed Badge & ID Holder With Velcro Closure This holder is made from genuine leather and can be cut exactly to fit any badge style. It is designed with velcro closure and intended to be worn primarily around the neck. This holder does not include heavy duty steel belt clip. It comes with ID/Credential section on the back and 30" beaded chain. 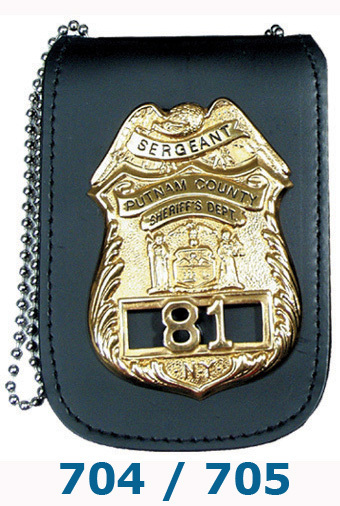 This holder is made from genuine leather and can be cut exactly to fit any badge style. It is designed with velcro closure and intended to be worn primarily around the neck. This holder does not include heavy duty steel belt clip. It comes with ID/Credential section on the back and 30" beaded chain. Universal models for neck wear! 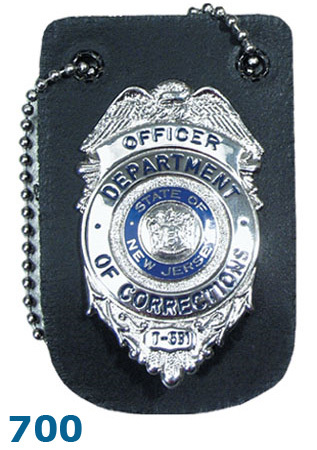 This neck chain holder is made from genuine duty leather and can be used with any badge with a pin & safety catch attachment. This holder is only designed to work around the neck. It does not work on a belt and it does not have an ID/Credential section on the back. 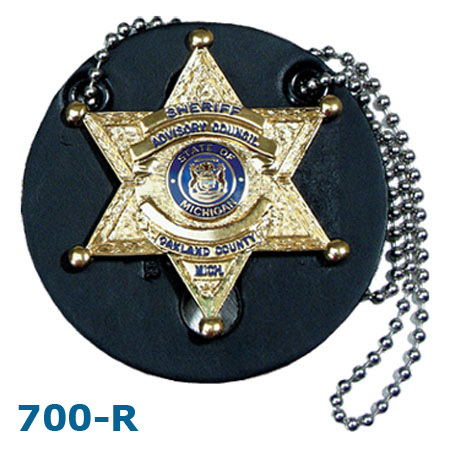 This neck chain holder is made from genuine duty leather and can be used with any badge with a pin & safety catch attachment. This holder is uniquely designed with velcro closure and intended to be worn around the neck. It has an ID/Credential section on the back. 30" beaded chain is included. 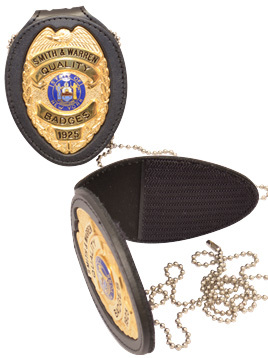 This neck chain holder is made from genuine duty leather and can be used with any badge with a pin & safety catch attachment. This holder is uniquely designed with magnetic closure and intended to be worn around the neck or can be worn in a shirt/blazer pocket. It has an ID/Credential section on the back. 30" beaded chain is included. 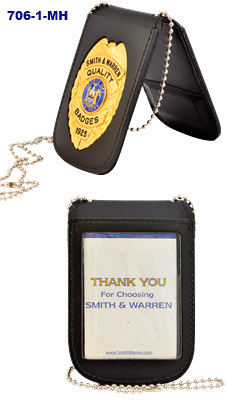 Universal Badge & ID Holder With Magnetic Closure This neck chain holder is made from genuine duty leather and can be used with any badge with a pin & safety catch attachment. This holder is uniquely designed with magnetic closure and intended to be worn around the neck or can be worn in a shirt/blazer pocket. It has an ID/Credential section on the back. 30" beaded chain is included. Custom-cut/recessed models for belt wear! 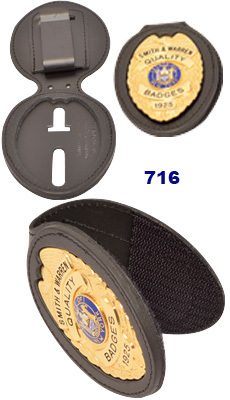 This high quality belt clip holder is designed to fit the badge of your choice exactly. It is made from genuine leather and with a high quality metal belt clip attachment. It comes with a velcro closure and can be supplied with a pocket and 30" beaded chain at an additonal charge. 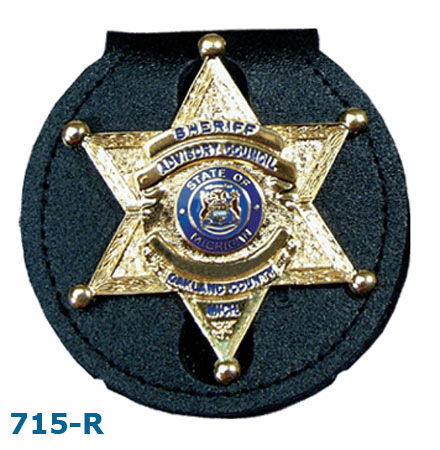 This recessed duty leather badge holder is designed to be used around the neck or on a belt. It does not require a velcro, snap or magnetic closure because of its unique design. It includes a 30" beaded chain and a heavy duty steel black belt clip. This holder does not have an ID section. Universal models for belt wear! 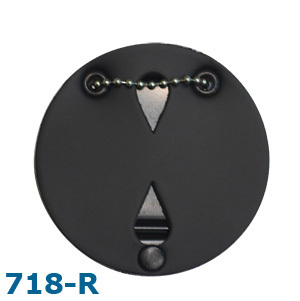 This high quality belt clip badge holder is best used with an oval shaped badge with pin & safety catch. It is made from genuine leather and with a high quality metal belt clip attachment. It comes with a velcro closure and can be supplied with a pocket and 30" beaded chain at an additional charge. Universal models for belt AND neck wear! 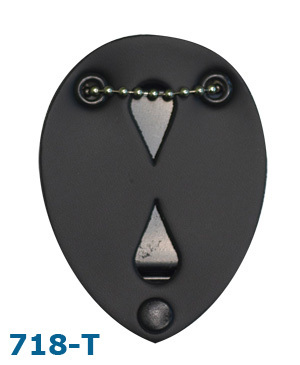 Made from Genuine leather, this oval shape holder can be used to hold your badge around the neck or on a belt. It includes a heavy duty steel belt clip and a snap closure. 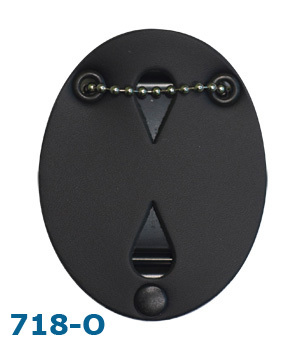 The holder is designed to work with any badge with pin & safety catch attachment. It is supplied with 30" beaded chain. Universal models for shirt/blazer pocket wear! 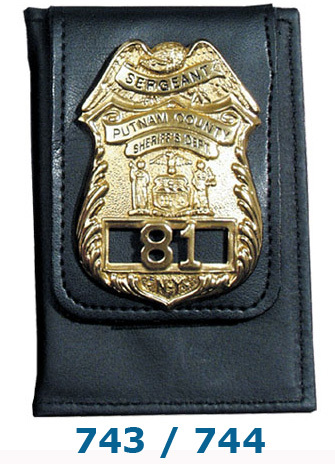 Made from top grain leather, this universal badge holder can accommodate any badge with a pin & safety catch attachment. 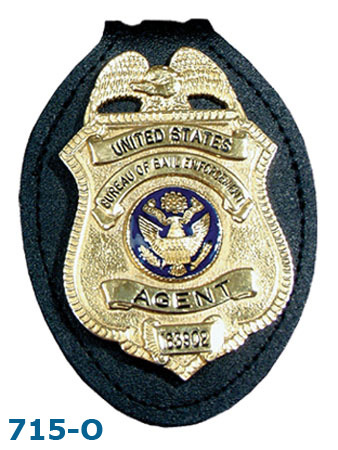 This is a great way to wear your duty badge on a blazer pocket. 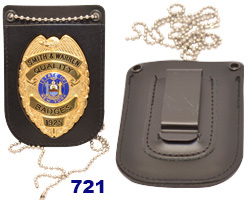 These cases are designed to hold your badge on an external badge flap. This allows you to expose your badge over your pants or coat pocket while keeping your credentials safely inside your garment. The cases are made from top grain leather with rounded and stitched corners for maximum durability. 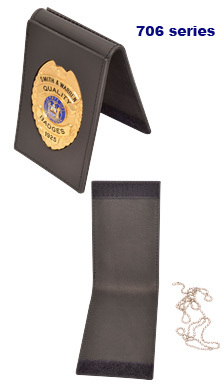 These cases are designed to hold your badge on an external badge flap. 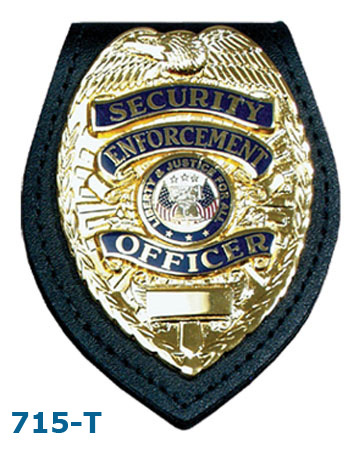 This allows you to expose your badge over your pants or coat pocket while keeping your credentials safely inside your garment. The cases are made from top grain leather with turned and stitched corners for a high quality finish.